"...longtime Burger King worker and activist Holly Dias, of Humboldt County, hugged the governor after tearfully describing how she struggled to support her infant son at the state’s lowest legal wage, which increased this year from $9 to $10 an hour." " Eddie Alcantara, 22, said he had worked his way up from $9 to $12 an hour and is now a supervisor at the restaurant. He said he is proud of his accomplishment and thinks others should have to do the same, and not just be paid higher wages from the start. “The minimum wage now is OK,” he said." That fellow was earning a few dollars above minimum wage already and seemed proud of it. In the comments to a story in the Times- Standard he wrote something along the line of, "Great. So now I'll be making minimum wage if this passes". Thus, in a way, Mr. Alcantara will be getting a pay cut with the minimum wage increase. That's the way a lot of people think about this sort of thing. They don't see it as bringing people up, but lowering themselves down. Thus everyone else raises their wages to stay ahead of minimum wage and, before too long, minimum wage earners are back to square one. As I wrote yesterday, there will always be someone at the bottom of the pay scale. Seems like our very own Holly Dias will be one of them. You might have heard there's a minimum wage increase being passed, or almost passed, by the state legislature. The San Francisco Chronicle's, Debra Saunders takes a critical look at it. It might surprise some that I'm not as against minimum wage, or increases of it, as much as it one might expect. I just don't think they do any good and cause problems for non- minimum wage earners in the long run. That a minimum wage exists in this state (some states don't have them) is water under the bridge. We're likely to have one at least for my lifetime, but I also agree with libertarians that what I make for doing a given amount of work should be between me and who I'm working for, not the rest of you. Still, prices rise over time and minimum wage earners do fall through the cracks. After all, it takes a literal act of congress or the state legislature to raise minimum wage while everyone else's pay goes up one way or another over the years. With that in mind, I'm not going to argue whether we should have a minimum wage, although I'll argue it shouldn't be raised too high or too fast. I just look at it from what I've seen in my life. What usually happens? The minimum wage goes up, then everyone else's wages go up. Not right away, but over time- unions usually among the first to demand higher wages so they keep their pay levels the same distance above minimum wage. Prices of things also go up over time and, before you know it, minimum wage earners are back to square one, barely able to get by. I got a part time job pumping gas for Ruell Oil Company back around '77ish. Minimum wage maybe 20 to 30 hours a week. I started out at what was then the Texaco Star and Bar at 4th and M Streets in Eureka. I worked for some weeks, maybe a couple months, before the station owner sent me to his Beacon station on myrtle and Mcfarland in Eureka. That station is now a Shell mini- mart if I remember correctly. I didn't realize it at he time, but I'd kinda been promoted as I was then one of the few full time employees of Ruell Oil Company. Still minimum wage, but 40 hours a week and I took that job to heart, going to the main station after my shift to pick up needed supplies and such. Back when I was at 4th and M Streets I was put on the night shift once week for maybe 3 weeks. One night a guy came in for gas that turned out to be the late Elwood "Bud" Maloney. He was dressed in a nice uniform with a badge. I was into uniforms at the time, noticed his "Burns Security" shoulder patch so asked him where he worked and how much he was paid. He told me he worked at Humboldt Bay Power Plant and made over $4.00 and hour, well above minimum wage at the time. I asked him how I could get on there. He told me to just go in and put in an application. I did exactly that within a day or two. About a week or so later I got a call from some security guy at the power plant asking if I could come in for an interview. We arranged a date and time. I went in and fumbled my way through the interview. By that time I was at the Myrtle Avenue station working full time 8am to 4pm. A week or two after the interview I was at home when the guy called me again with a job offer. He said they couldn't put me on full time right away and I'd be a "relief officer", meaning I'd only cover for others when they're sick or otherwise unavailable to work. I jumped at it and started that job soon thereafter, but they allowed me two weeks to notify my current boss. My last day at Myrtle Avenue Jerry Ruell, the boss, called me and asked to clarify him on my new job, saying that security companies tend to be fly by night outfits and I probably wouldn't have a job there for long. I didn't realize from that part of the discussion he was trying to talk me into staying. Then he said he'd make the manager of the Myrtle Ave. station and put me on salary. I told him I really didn't want to pump gas the rest of my life. He seemed to understand. I have no idea what his "salary" would have been. I have no doubt it would have been over minimum wage but after I left there I made over minimum wage at Humboldt Bay Power Plant. That was two above minimum wage opportunities coming at me at once. That's how I did it. Had I stayed on pumping gas and hoping someone would raise the minimum wage, I'd still be relatively poor, or had been replaced by automation as actually happened to many of us gas pumpers, and is likely to affect more and more minimum wage workers, especially with minimum wage increases. I weaseled my way out of that. The State of North Carolina recently passed a law that supposedly nullifies local laws that prohibit discrimination based on a person's sexual preferences. At least that's the way I read it. As I wrote before, I think these sorts of laws don't go far enough. Businesses have the right to to do business with whomever they want. them. On the up side, I was surprised to notice up on the wall to the left of the counter one of those signs that read "We reserve the right to refuse service to anyone". Good, we need more of that and any fooling around with discrimination laws should be with intent of reinforcing the message of those signs. I'm not a big fan of Jack In The Box, especially since they no longer offer the Portabello Mushroom Burgers, but I'll try and make a point of going in there more often if only because they have that great sign. Speaking of Uber. that new taxi service I mentioned the other day, it's been taking heat from various interests. Most notably, old style cab companies upset with those who threaten their monopoly. Reason magazine has an article by an Uber driver describing why he likes it and, perhaps more importantly, why at least one other writer doesn't. It will be interesting to see how Uber fares, especially in this state, with so many people who think as the Uber critic in the story does. "What can you do in ten seconds to reduce earthquake impacts? It turns out quite a bit. Surgeons can stop a delicate operation, traffic onto bridges controlled, elevators brought to a floor, power stations set to a safety configuration and trains automatically slowed." I'm still a bit skeptical. I suspect most of us would stand there wondering what the alarm was, or whether it was a false one. That would negate the advantage of a few seconds warning. Then there's tsunami warnings, the nuts and bolts of which we already have in place. But even with those warnings people end up drowning. The Lost Coast Oupost did a recent story on our recent tsunami drill up here. I made a point to comment there and bring up something I've never heard Lori Dengler mention. She always says if you're near the ocean and feel a long earthquake, seek high ground as a tsunami may be on the way. But what if you don't feel a quake? Maybe a better indication of tsunami is what the ocean does? If the water level recedes quickly, that's a good indication of a problem. I recall reading that during the big pacific quake of years ago, people in Thailand didn't feel the quake- it having centered hundreds of miles away. Some tourists were on some bay there and saw the bay empty itself of water rather quickly. Some of them apparently walked out on the then exposed floor of the bay to look at it only to be drowned when a tsunami came into the bay with a vengeance. I heard a similar account on TV of the tsunami in Hilo, Hawaii. A schoolteacher had her class on the beach when the water suddenly withdrew, exposing rocks that quicly turned to tidepools with stranded fish flopping around. The teacher sent the kids down to catch the fish. The tsunami came in shortly thereafter and got the kids. You have to wonder if that is a lesson learned, yet I recall TV footage of the aftermath of the pacific earthquake in Hawaii. The water was pulling back from some bay, yet there was some guy out walking on the newly exposed rocks. Lucky for him the tsunami never really showed up, at least while I was watching. Which isn't to say that receding water always precedes and earthquake. The late Pete Davenport- a retired Eureka police officer- told me of being in Old Town, Eureka during the Crescent City tsunami of the '60s. He told me of watching the bay, "I've never seen the water drop so fast". Of course, the tsunami didn't amount to much that time and Eureka came out unscathed. Anyway, as I wrote on the Lost Coast Outpost, if you're at the beach and the water starts acting strange, seek higher ground even if you don't feel an earthquake. I've been thinking of that Uber taxi service ever since the guy at the Stanyan Park Hotel spoke with me about it and decided to see if they had any drivers up here. I thought about it even more after reading in the Times- Standard of a guy at Eureka's City Cab chastising the Fortuna City Council for not making it easy enough for their drivers to work in Fortuna. I thought, "How about Uber", since I'm asssuming there's currently no cab service in Foruna. Found their web site and it appears they''re mostly in bigger cities But, I tried their Become a Driver link and Eureka, CA popped up as soon as I entered an E in the city field. Not sure just what that means. Maybe they might consider having some drivers up here? Fortuna might be a different story, being so much smaller. I would think you'd spend most of your time there just sitting and waiting for calls. Anyway, maybe a job opportunity if your car is in good working order and gets decent gas mileage? The North Coast Journal has a story on something I hadn't much thought about, even after reading about the sinking of the Dennis Gayle earlier this year: There's a number of boats in Humboldt Bay in poor condition and their sinking can cause problems. Label me skeptical, though. I can't help but wonder if the supposed environmental problems are overblown and more the result of hysterical environmentalist thought than a serous threat to the bay? Yep, there's fuel and oil in some of them, but think back to WW2 and the sites of naval battles where big ships were sunk. Doesn't seem like those sites were forever tainted. I realize our small and shallow bay isn't quite the same thing as a very vast and deep Pacific Ocean but, when you think about it, even the larger ships that have dumped a lot of oil in the bay haven't seemed to have much in the way of lasting effects. I'm not saying we shouldn't be concerned about derelict boats in the bay. I'm just saying we need not be hysterical about them. "The most worrisome thing about Merrick Garland, President Obama's choice to replace the late Antonin Scalia on the Supreme Court, is that reporters routinely describe him as "moderate." Although that label is supposed to be reassuring, in politics it usually refers to people who combine the worst aspects of the left and right, united by an expansive view of government authority and a narrow view of individual rights." I appreciate those that don't hang too far to the left or right, but the point about moderates is spot on. I'd argue Donald Trump fits this definition of moderate. Lorretta Sanchez For U.S. Senate? The Sacramento Bee takes a look at this year's U.S. Senate race, the incumbent, Barbara Boxer, retiring this year (finally! ).I haven't really thought much about this one. Maybe because the two main candidates are democrats I figured I wouldn't vote in that race. But the Bee gave Sanchez a pretty good wirite up, or so it seemed to me. That actually makes me suspicious of her as I'm well aware of the Bee's authoritarian politics. One of those things where, if they like her, I most likely won't. Then again, Sanchez' main opponent, Kamala Harris, got the endorsement of the state's democrats which is pretty much the same kind of thing. Sanchez, who holds a seat in the U.S. House, voted against the invasion of Iraq. That's a good thing, especially since she actually did it and won't be just saying she would have. That's important, yet I don't yet know Harris' stand on that. Unlike Sanchez, Harris can say she whatever she wants- assuming she thinks it will get her more votes. Military intervention is my big issue in the November election but, in this case, considering either of them on that issue alone is more a toss of the coin. I might not even vote at all in that race, but it's still early. 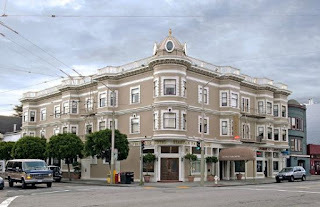 I'd checked out their web page and read a few decent reviews of the Stanyan Park Hotel in San Francisco, so the wife and I decided there was no way we could stay there: Waaay too expensive!!! It took rather extraordinary circumstances to change my mind, but change it did, on Saturday night. I'd spent 4 days at USCFs' Mofitt Hospital undergoing chemotherapy. Time came to leave Saturday afternoon and I was expecting the wife to arrive any time to pick me up. To make a long story short, I learned at the last minute she wasn't on her way and was, in fact, still in Eureka. That made me nervous as I was almost done being discharged. Where could I stay? But, I said No. I'd had enough, so time to leave. I figured I could easily get a room at the Carl Hotel which is relatively inexpensive and just a few blocks from UCSF- easy walking distance. One of the nurses became aware of the situation and told me she was concerned it might be seen as them "dumping you out on the street'. I told her not to worry as the Carl Hotel seemed to always have at least one room available, so off I went to the Carl. Rough walk, even with my roller equipped suitcase. Fortunately, it was pretty much all downhill. Having been to the Carl at least a couple times before, I was pretty confident I'd easily find it, despite it getting a bit late in the day. Then I found myself confused when I couldn't find it where I thought it should be.I walked half a block each way, the problem being all the buildings looked the same from the sidewalk. I finally got out my new smartphone and tried finding it on a map. That didn't work and I started up and down the street again. I finally swallowed my pride and asked a guy I'd seen walking back and forth in the same area where the Carl was. He pointed me to it. That left me with the option of waiting to see if the guy would show up to claim his reservation, but it might well be dark by then. I asked the girl if she knew of any other places I could stay. She pointed in one direction saying there was a place a couple blocks down that street. The only other suggestion was to take a train to the Ocean district and stay at some place whose name escapes me, alhough I have a fiiend who stays there regularly. I wan't going that far without a car. I might never make it back, and it might make it harder for those coming to get me to find me. So down Stanyan Street I went looking for the hotel. I hadn't asked the name of the place. Perhaps because I didn't want to know. If it was the Stanyan, I would almost have to refuse before even seeing it if only because it was too expensive. I went a couple or three blocks wihout seeing any obvious signs of a hotel and finally had to ask someone if they knew of one. A younger guy pointed me just a half block down the street. There it was. I couldn't read the name on the sign, at first, but there was a lit neon sign at the bottom advertising a vacancy. SAVED!- no matter what place it is. Yep, it was the Stanyan Park Hotel and not at all what I'd expected. For one thing, I figured it would be in the other direction, up in the hills in the residential areas. Their web page made it sound like one of Eureka's bed and breakfast homes. That sort of place wouldn't fit in to this neighborhood. Not a bad neighborhood, just not real high class. I went inside and was struck by how clean and upscale it seemed. Off to the left was what would turn out to be the breakfast room, but business first. I asked the clerk if they had a room. He seemed hesitant to deal with me at first, then warmed up and said they had room with twin beds for around $250(!!! ), I was a bit stunned as that was even more expensive than what we'd seen on their web page, BUT, I told myself, desperate times call for desperate measures. He took my credit card, told me the rules and I took the elevator to my room, #202. Nice elevator in good working order. I got to my room and was impressed: very clean, quiet, warm and fairly large. It even had one of those windows that kinda stuck out over the sidewalk where I could stand and watch all the hustle and bustle on Stanyan Street. I was surprised at all the activity, especially parents with kids. It seems these few blocks were the social center for people living in the area. After getting everything put away I walked back the way I came and made a beer run to the liquor store in sight of the hotel's front door. Then I noticed all the other businesses along the street including a pizza place, a McDonald's and a pub just three doors down from the hotel. Nice, compared to most places we stay where we usually have to drive to find food. Went back to the room and watched TV on my nice modern flat screen. Got to talking to the guy at the front desk for a bit. He was real enthusiastic about Uber- that new taxi service. Said he's saved a lot of money using it. I thought I should use that if I needed to get back to UCSF, except I only had $1.00 cash to my name right then. I tried going to bed around 10pm, being pretty much exhausted. Bed was nice and room quiet but I couldn't sleep. Then, around 11:00 a noise outside got my attention and I knew what it was: the sound of bottles breaking. I'd heard it before when guys are trying to reduce the volume of their recyclable glass. After about 45 minutes I got up to look out the front window and saw a guy behind a small flatbed truck filling the truck with glass from the recycling bins on the sidewalk. I wondered if he was stealing the stuff as I'd read of them having a problem with that down there, but he didn't seem concerned and the bed of the truck was full of glass. He finally moved on and I went to sleep. Woke up around 5:30 a little hungry and eager to try the breakfast room, alhough I was still suffering from what I call chemo gut, or chemo belly. Not quite the nausea I've heard of chemotherapy patients experiencing but mostly a queesy stomach that results in a lack of interest in food. I'd thrown up the morning before, in the hospital, just thinking of food. Breakfast room was nice with plenty of the usual: hard boiled eggs, toast, cereal, waffles and more. I grabbed a couple hard boiled eggs, made a couple pieces of toast and poured a cup of coffee. Not bad but my chemo belly acted up and I quickly lost interest in eating more. Still, if I'd wanted to, there was enough there to fill up on. Only a couple others there while I was in there. A couple hours later when I walked by, the place looked packed. Connie had called and I figured she'd show up between noon and 12;30 that day. I packed up my stuff and asked the front desk if they cared if I kept the room key until after check out time which was 11am.I wanted to show Connie and her sister the room as it was quite nice. They had no problem with that. I should hope so, for the money I paid. Around 11;30 I cleared out the room and went to wait in the lobby. I didn't need my stuff in the room to show it off and moving early could help speed things up. Got to see some other guests get picked up by an Uber cab while I was waiting in the lobby. No signs on the car, which why I suspected it was Uber, and the girl working he desk called the cab so I asked her. My ride came just before 12;30. Fortunately, there was an open parking space out front, parking seeming to be at least a little more available than at The Carl. My two drivers seemed to like the hotel and my room despite its high price. We got into the car and left. As I turned in my key, the front desk clerk told me guests of guests can use the same things actual guests can take advantage of. Good to know. If my drivers had shown up earlier- before 10am- they could have availed themselves of the breakfast room. President Obama announced his first pick to replace the late Antonio Scalia on the Supreme Court. He seems to be a mixed bag in some respects but, as one would expect, he also seems to generally be a defender of government power. Reason magazine takes a look at him. Humboldt Redwoods State Park at Weott makes the list of the top ten haunted campgrounds of Northern California. Hat tip to local LP busy body, Tammy Newcomb, for the link. Barry Evans' column today in the Lost Coast Outpost deals with high incarceration rates in the U.S. He also tends to point the finger at the late Nancy Reagan for contributing to those high incarceration rates with her Just Say No to drugs campaign she started. Disclosure: I'm a Nancy Reagan fan, but I don't think it's fair to point the finger at her. Evans even writes he's not trying to blame her specifically. I wrote a comment to Evans' column. I'll try and make the same point here. I don't see how someone can criticize Nancy's Just Say No campaign. It seems to me that would be the most libertarian way of addressing the issue allowing for personal choice, if nothing else- the decision to use drugs, or not, made by the kids themselves. Not unlike guidance by parents meant to keep their kids from doing bad things. It wouldn't surprise me if she supported long confinement times for drug use but I don't recall hearing of her advocating that. Regardless, if she did, she wasn't the only one and that others jumped on the anti- drug bandwagon, eventually leading to harsh penalties, I won't blame Nancy for all the others that jumped on the issue and escalated it. Evans also mentions the formation of the failed Drug Abuse Resistance Education that started back then. He points out kids subject to that program were actually more likely to use drugs snd be arrested than those that weren't. I'm actually one of them. I got arrested for drugs at school back in 1969 when it was a big deal. Maybe one of these days I'll tell that story here. "In fact, recent data shows that the it’s becoming the fastest growing party in the United States." That's hard to believe, although I've never understood why more people aren't registered to vote with the LP as registration doesn't cost anything. Does this mean the country is moving more in a libertarian direction? I doubt it, despite recent polls saying more and more people think the government is more of problem than a help. I tend to think the country is becoming more authoritarian, especially when you look at the front runners in the presidential election- Clinton and Trump- who tend to be authoritarian. And it seems most people support them all the way, although much of that support is based on partisan loyalty. I suppose living in California, an authoritarian state, would make it easy to feel that way. If any of you would like to register to vote as a libertarian, you can do it here at the Secretary of State's web site. Costs nothing and you'll feel better about yourself. I agree wholeheartedly, especially after reading time and again about what goes on with politically correct college campuses. Maybe they should start offering classes on this? Just noticed this online survey from the Eureka Police Department asking for your opinions on various crime related issues. Very disappointed to read in the Times- Standard of the City of Fortuna considering more smoking restrictions in their city. I'm not all that fond of Fortuna but felt it was run with a little more common sense than most other towns up here. I guess I was wrong. So why are they going after the most rapidly declining minority in the country? I can only assume for the same reasons everyone else does: Because they can, and it's probably fun beating up on a group that is least able to defend themselves. I was out of town when it made the news so couldn't coment on it at the time, but I was surprised to hear of Eureka Mayor Frank Jager coming out in favor of a sanctioned homeless camp. Surprised, if only because I felt Frank wasn't really all that comfortable with taking constroversial stands on things aside from prayer at city council meetings. I've no hard feelings over this, either. After all, this plan isn't any less likely to be a drain on the city than any of the oher proposals such as renting them all places to sstay. This keeps the homeless population limited to one area, at least when they're "home". Might be easier to close down a camp, if necessary, than to throw eveyone out of their city provided rentals. Plus, if they're all staying down at the camp, at least I don't have to worry as much about them moving in next to me. I'm sure I've done the same thing in the passt: Call someone a "socialist", but over the years I've become uncomfortable with using that word as a negative attirbute. 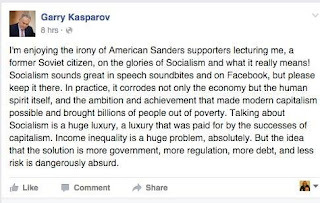 Not that I mind people calling someone a socialist, but rather than use it as a dirty word, explain why socialism isn't a good thing. 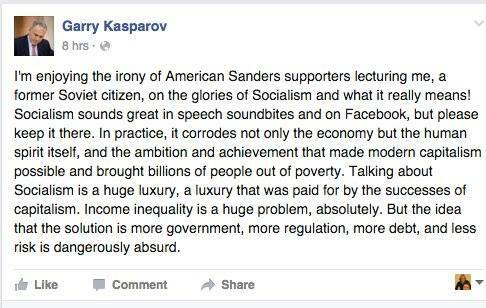 Addendum: The fellow featured in this article says Sanders isn't a socialist. With the trial of Gary Bullock- accused of the New Years Day murder of a catholic priest- beginning, the media tuirns to covering the trial. Blogger John Chiv and the Times- Standard seem to be focusing on Bullock's phone all to his grandmother asking her to bail him out of jail. The way I read it is they want that request to be seen as, if not a smoking gun, then a sign of guilt or at least evidence Bullock isn't a nice guy. I'll beg to differ. How can we demonize someone for asking someone to provide bail? I'm sure any one of us might call someone to get us out of jail whether we're guilty or innocent. I've gotten the impression there's more than enough evidence of Bullock's guilt. There's no need to demonize him with irrelevant actions any of us might well have done under the same circumstances.